Penne alla vodka gets reinvented for a recipe that's short of dairy but full of flavor. 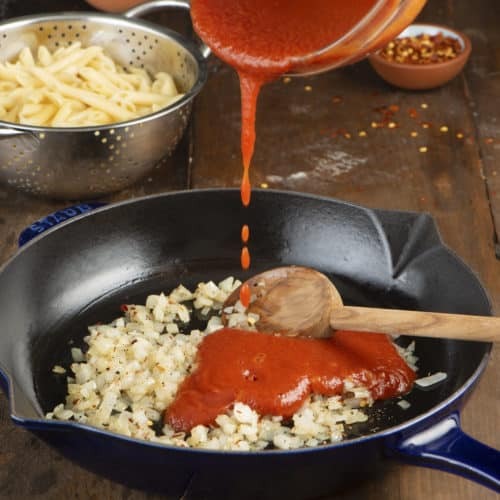 Meanwhile, heat olive oil in large skillet set over medium heat; cook onion, oregano, half of the hot pepper flakes, salt and pepper for 3 to 5 minutes or until onion is slightly softened. Remove skillet from heat. Add vodka; return to heat and cook for 1 minute. Stir in tomato sauce; bring to boil. Reduce heat to medium-low; stir in almond milk and simmer for 5 to 10 minutes or until thickened slightly. 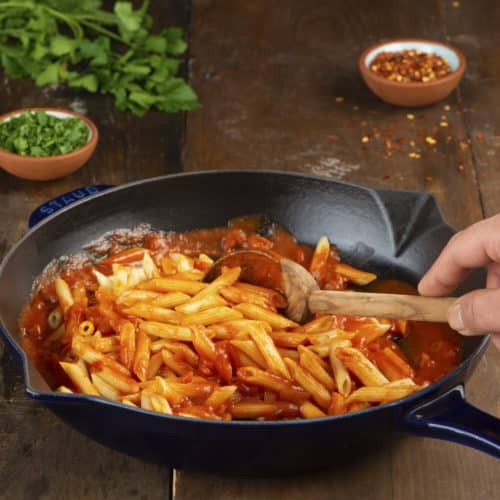 Add pasta to skillet; cook, tossing, for 1 to 2 minutes or until well coated. Stir in parsley. Transfer to plates; garnish with remaining hot pepper flakes. Tip: Fresh or frozen peas make a nice addition to this pasta.